From top left: The city skyline, Sichuan University, Jinli, Jing River and Anshun Peaceful and Fluent Bridge. 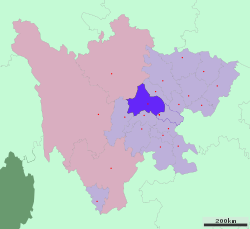 Chengdu (Cheenese: 成都; Sichuanese: Cen2du1; pinyin: Chéngdū), umwhile transliteratit Chengtu, is the caipital o Sichuan province in Soothwast Cheenae. It haulds sub-provincial admeenistrative status. The urban aurie hooses 14,047,625 indwallers: 7,123,697 within the municipality's nine destricts an 6,730,749 in the surroondin region. 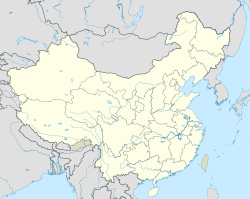 In 1979, Chengdu signed a sister ceety agreement wi Montpellier, Fraunce, the first pair o Sino-French sister ceeties. Later Chengdu signed sister ceety agreements wi ceeties in ten kintras, as well as signin a friendly region agreement wi the Dalarna province in Swaden. Chengdu haes haed mony friendly exchynges wi the sister ceeties. Montpellier, for example, haes a Chengdu Street an a Chengdu Plaza. The soccer team Chengdu Blades is ained bi Sheffield United F.C. ↑ "Phoenix Sister Cities". Phoenix Sister Cities. Archived frae the oreeginal on 2013-07-24. Retrieved 2013-08-06. This page wis last eeditit on 11 Mairch 2018, at 09:03.